Despite the best efforts of vendors, despite all the human factors and usability research that’s gone into business intelligence products, and no matter how much training you provide to your data warehousing users, you always have someone who doesn’t grasp the concept of painting a report screen, doing a drill-down analysis, or taking full advantage of the power available from today’s tools. Or these folks might think they’re too busy to figure it all out. Believe it or not, the mentality that computers are for “clerical types” still pervades many of corporate America’s executive suites. Most of these folks grudgingly accept delivery of that brand-new, supercharged laptop (although they still refuse to type their own letters) and want to do only “a couple of things” with the computer. Should those people be shut out of the world of business intelligence in your data warehousing environment? No! In most cases, you need to create an environment that has a set of dashboards and scorecards. Dashboards and scorecards, like other areas of business intelligence, predate the data warehousing era — evolving from the executive information systems (EIS) of the 1980s and 1990s. Alas, like early multidimensional analysis (pre-OLAP OLAP), no one realized the full power of an EIS at the time, and the EIS faded to the background while full-scale business intelligence solutions took hold along with data warehousing. A dashboard is a collection of graphs, reports, and KPIs that can help monitor such business activities as progress on a specific initiative. Everyone who’s driven a car has seen a dashboard. 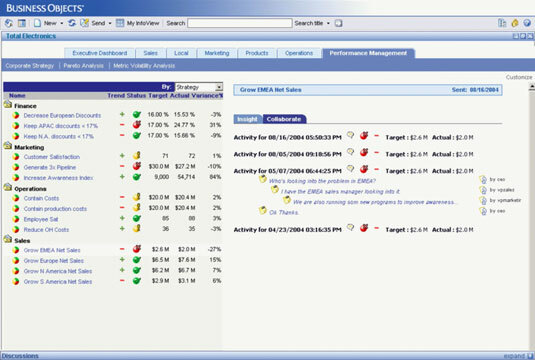 A dashboard (whether in your car or on your computer) provides a lot of information in a summary form to show you how you’re currently performing in an operational manner. Your car dashboard shows you how fast you’re currently going, and you have to evaluate whether this value falls within the target speed limit. Alongside this information, you can find out what your fuel level is, how many miles you’ve traveled, what the temperature of the engine is, and . . . well, whatever that tachometer thing is supposed to tell you. A business intelligence dashboard is the equivalent of your car’s dashboard. In your data warehousing environment, this business intelligence dashboard shows users the effectiveness of operations. You can build a dashboard that supports a wide variety of users, from individuals to the company as a whole. As shown in this figure, when built correctly, dashboards can give you quick insight into company performance. Scorecards, as shown in this figure, distill information into a small number of metrics and targets. With a scorecard, your users get an at-a-glance perspective of information. Scorecards are designed to increase productivity by allowing users to stop sifting through stacks of reports to find what’s right or wrong with the business in relationship to the corporate strategy. Scorecards show users immediately how the company, a division, their team, or they themselves are performing against targets that were set within the overall strategy or plan.